I have been working on this drawing for awhile now. Adding different backgrounds to my flower portraits has been an idea in my head for some time, but I have had trouble trying to figure out how to do it. I have tried before with smudgy type backgrounds (technical term there), but I have never liked it. 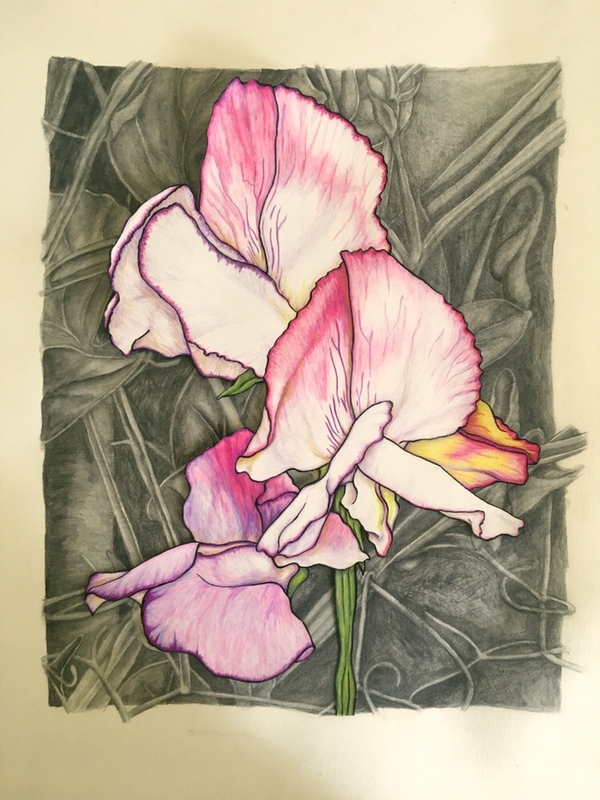 The idea for this background came to me when I was photographing some sweet peas last year and was looking at the great pattern of the stems and tendrils and thought they would make a good background, especially if I did them in grey scale. This also gave me the chance to use my water soluble graphite sticks. I always love the chance to play with new art supplies and it may even justify their purchase! Although I am fairly happy with the result, I am not completely sure that this is the answer. The sweet peas are cut out and are just sitting on top of the background, so nothing is set yet. When I am not sure of a picture I have a few techniques I try to get another perspective on the work. Put the whole thing away and look at it again in a few weeks. Not having seen it for awhile gives me fresh eyes to look at the work again to see if I really do like it or not. The opposite of this is to stick it on the wall where I can look at it for awhile to figure out what is not working. Taking a photo of the work is my third way of figuring out what is the problem, making it black and white can help, especially if you do not have enough contrast, as this is hard to tell sometime with coloured work. If you have a different technique please share it with me as I always need help. Last weekend I went back to one of my favourite nurseries, Lambley Nursery just out of Ballarat, as they had a garden tour and you could visit their sweet peas that they grow for their flower seeds, over 100 varieties. The sweet pea I drew is from their garden last year and is called Fire and Ice. I took a few photos, (over 70, but who is counting) and have included a few of my favourites for your viewing pleasure. Might be a second Sweet Pea picture…. Happy New Year to all the lovely readers of this blog. 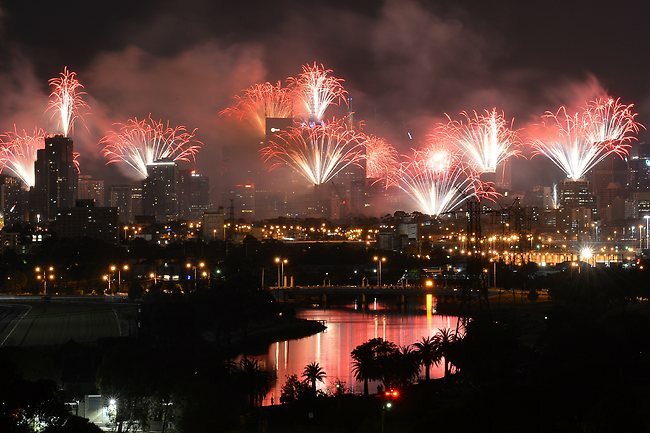 This is the fireworks in Melbourne last night, I had the privileged position of being on the top of one of the south bank apartments in town, 28 floors up. We were right in the midst of all these fireworks, an absolutely spell binding view. We were literally on the roof which was a little scary, but worth it for the show. 2012 was such a great year for me, I have restarted my art, which is so exciting in itself and this blog and the generous support of my readers, the comments, likes and views have been wonderful. When I started I did not know if any one would see it and now I have over 70 followers. It has kept me going, even when my energy levels have been low and I do not post as often as I would like, this blog and its supporters have made me get back on track so thank you. I still battle with Chronic Fatigue and sometimes I do not have the energy to draw, paint or write. I also had my wonderful trip to France which I shared with you, and again because of the blog I was committed to keeping a journal of the trip and it has been so fantastic on many levels. 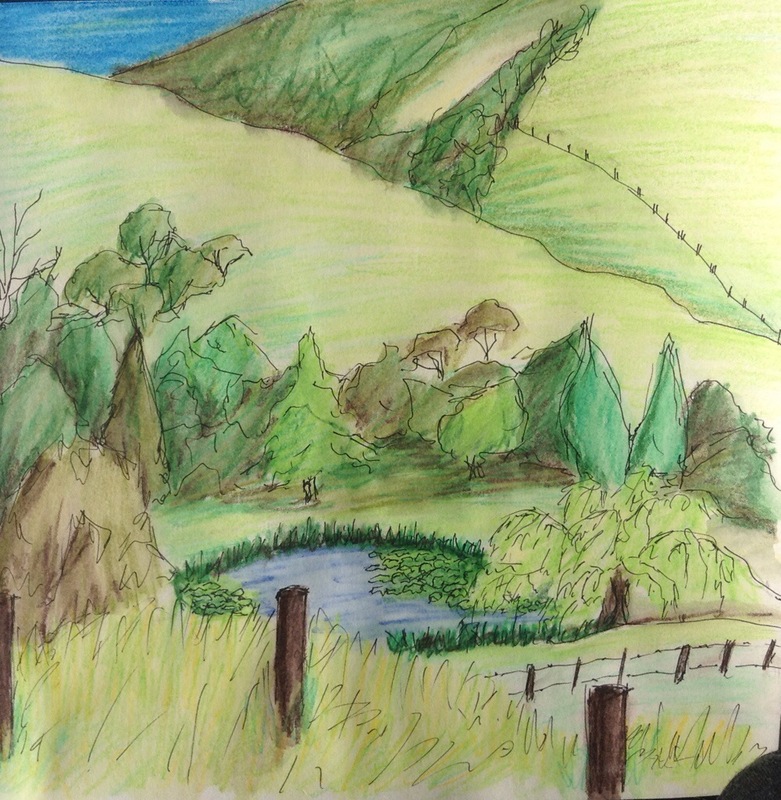 I did some lovely, quick, loose drawings of the scenes that caught my eye, I have the best keep sake of the trip, I was able to share it with not only my friends and family, but with so many of you out there. It enriched the whole trip so much more than I had thought. I will start an Etsy Store and see what that brings. I am going to do some relief printing classes, so look out for some prints. Just be grateful to be able to continue to create and share the results and the journey with you. I might even finally figure out Facebook and get my work out on it. As always I have a great many plans, we will see how the year and the energy goes, but I am hopeful and content with how things are improving. So thank you for your support and my family who give unstintingly in their support and understanding of me.